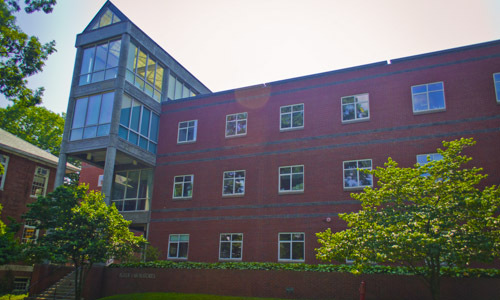 Built in 1990, Fuller Labs was named for George F. Fuller, former chairman of Wyman-Gordon Co. and a longtime WPI trustee. Fuller is home to the Computer Science Department as well as the Computing and Communications Center and Academic Technology Center. It serves as the heart of WPI’s high-speed computer network, which reaches every classroom, lab, office, and residence hall room on campus, as well as off-campus fraternity and sorority houses. Fuller also contains several general access labs filled with Unix workstations, high-power PCs, Macs, laser printers, and other computer equipment. Its Perreault Lecture Hall is equipped with modern AV equipment, and its 35mm projectors and Dolby sound system make it a great place to watch films shown frequently by the Social Committee and Lens and Lights Club. The third-floor study lounge offers great views of Institute Park. Computer Science Department, MS Thesis Presentation, Brian Zylich " Training Noise-Robust Spoken Phrase Detectors with Scarce and Private Data: an Application to Classroom Observation Video"
Computer Science Department, PhD Research qualifier presentation, Ruixue Liu " Evaluating Rule-based Programming and Reinforcement Learning for Personalizing an Intelligent System"